Archie looks smug about managing to keep both Betty (left) andVeronica hanging for almost 70 years — but in an upcoming issue, promisesArchie Comics, he will finally choose between them with a proposal of marriage. The worldwide financial collapse was a Sundayschool picnic compared to this. Come August, civilization as we know it iscoming to an end: Archie Andrews is getting married. You read that right. After 68 years of keeping notone, but two high school hotties on a string, comics’ most successful player isgetting hitched (even the supposedly invulnerable Superman succumbed to Cupid’sarrow and let Lois Lane drag him up the aisle back in 1996). Is nothing sacred? The news leaked out Wednesday on the Internet andin the official source of all things relating to celebrity gossip, the New YorkPost, which ran the shocking story under the headline: “BETTY OR VERONICA? ASKARCH”Archie Comics’ official blog confirmed the epochalnews, digging into its cache of exclamation marks to declare: “ARCHIE ANDREWSIS GETTING MARRIED! According to the blog, the six-part story ofArchie’s long-delayed passage into adulthood will begin in Issue 600 of hiseponymous comic book “Archie.” It will ship on Aug. 12 and be available incomics shops on Sept. 8. In the story, Archie has finally graduated fromRiverdale High School; in fact, he’s five years older and a college graduate. (We told you this was the apocalypse.) He may even have an actual job when hegets engaged. But to whom? Will it be the elegant VeronicaLodge, daughter of wealth and privilege? 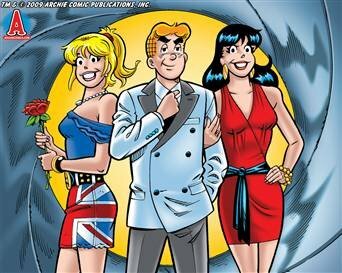 Or will it be girl-next-door BettyCooper? And who’s going to be best man? It can’t possibly be that wise are Reggie, can it? Our money is on Jughead, who still can’t lose that goofy hat he’s been wearing since Bob Montana first drew it on his tousled head way back in 1941. Where “Star Wars” fans meet up with friendsdressed up as characters from Japanese anime and everyone tries to find the perfect comic book. One thing we know for sure. If it’s Veronica, herrich daddy, Hiram Lodge, is going to have a fit. And he can afford a lot oflegal help.Writing the story for Archie Comics is comic bookaficionado and movie producer Michael Uslan, who resurrected the Batman movie franchisein 1989. Longtime Archie Comics artist Stan Goldberg will illustrate the tale.